(Nanowerk News) A team of cardiologists, materials scientists, and bioengineers have created and tested a new type of implantable device for measuring the heart's electrical output that they say is a vast improvement over current devices. 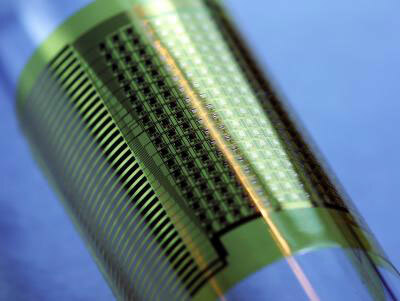 The new device represents the first use of flexible silicon technology for a medical application. "We believe that this technology may herald a new generation of active, flexible, implantable devices for applications in many areas of the body," says co-senior author Brian Litt, MD, an associate professor of Neurology at the University of Pennsylvania School of Medicine and also an associate professor of Bioengineering in Penn's School of Engineering and Applied Science. "Initially, we plan to apply our findings to the design of devices for localizing and treating abnormal heart rhythms. We believe these new devices will allow doctors to more quickly, safely, and accurately target and destroy abnormal areas of the heart that are responsible for life-threatening cardiac arrhythmias. A new type of implantable device uses flexible silicon technology. "Implantable silicon-based devices have the potential to serve as tools for mapping and treating epileptic seizures, providing more precise control over deep brain stimulation, as well as other neurological applications," says Story Landis, PhD, director of the National Institute of Neurological Disorders and Stroke, which provided support for the study. "We are excited by the proof of concept evident in the investigators' ability to map cardiac activity in a large animal model." "The new devices bring electronic circuits right to the tissue, rather than having them located remotely, inside a sealed can that is placed elsewhere in the body, such as under the collar bone or in the abdomen," explains Litt. "This enables the devices to process signals right at the tissues, which allows them to have a much higher number of electrodes for sensing or stimulation than is currently possible in medical devices." Now, for example, devices for mapping and eliminating life-threatening heart rhythms allow for up to 10 wires in a catheter that is moved in and around the heart, and is connected to rigid silicon circuits distant from the target tissue. This design limits the complexity and resolution of devices since the electronics cannot get wet or touch the target tissue. The team describes their proof-of-principle findings in the cover article of this week's Science Translational Medicine. The team tested the new devices – made of nanoscale, flexible ribbons of silicon embedded with 288 electrodes, forming a lattice-like array of hundreds of connections – on the heart of a porcine animal model. The tissue-hugging shape allows for measuring electrical activity with greater resolution in time and space. The new device can also operate when immersed in the body's salty fluids. The devices can collect large amounts of data from the body, at high speed. This allowed the researchers to map electrical activity on the heart of the large animal. "Our hope is to use this technology for many other kinds of medical applications, for example to treat brain diseases like epilepsy and movement disorders," adds Litt and co-senior author John Rogers, PhD, from the University of Illinois. In this experiment, the researchers built a device to map waves of electrical activity in the heart of a large animal. The device uses the 288 contacts and more than 2,000 transistors spaced closely together, while standard clinical systems usually use about five to 10 contacts and no active transistors. "We demonstrated high-density maps of electrical activity on the heart recorded from the device, during both natural and paced beats," says co-author David Callans, MD, professor of Medicine at Penn. "We also plan to design advanced, 'intelligent' pacemakers that can improve the pumping function of hearts weakened by heart attacks and other diseases." For each of these applications, the team is conducting experiments to test flexible devices in animals before starting human trials. Another focus of ongoing work is to develop similar types of devices that are not only flexible, like a sheet of plastic, but fully stretchable, like a rubber band. The ability to fully conform and wrap around large areas of curved tissues will require stretchability, as well as flexibility. "The next big step in this new generation of implantable devices will be to find a way to move the power source onto them," says Rogers. "We're still working on a solution to that problem." This research is a result of a collaboration between the Rogers laboratory, where the flexible electronics technology in the devices was developed and fabricated, and Litt's bioengineering laboratory at Penn, where the medical applications were designed and tested. Heart rhythm experiments were designed and performed in Callans' cardiology laboratory. Mechanical engineers Younggang Huang, PhD, and Jianliang Xiao at Northwestern University and University of Illinois performed the mechanical modeling and design that enables the devices to wrap around the heart and other irregular, curved organs. Litt and Rogers note that the core of their collaboration is Penn Bioengineering PhD student Jonathan Viventi and University of Illinois post-doctoral fellow Dae-Hyeong Kim, PhD, who are co-first authors on the publication. The work was also supported by Joshua Moss, MD, a cardiology fellow at Penn, and several undergraduates and master's students.